Are you prepared in case of a Disaster, Theft or Fire? Home Management Wolf makes it easy to manage your Home & Properties and keep track of all your assets and possessions. Your Home is the biggest investment you will make in life. Protect it by tracking all aspects of ownership. Whether you own or rent, keeping detailed records is in your best interest and protects you against loss in the event of a catastrophe, theft or warranty disputes. Track home maintenance, repairs, mortgage payments, assessed value, insurance, warranty information, costs and more. Create a Home To-Do List to manage your home projects. 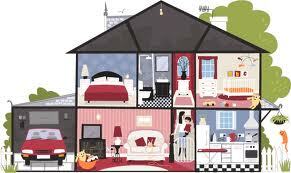 Save important home ownership documents, warranty & insurance information. Link unlimited images and file attachments to each home or property that you own. Find important information quickly and easily. Maintaining a detailed catalog of what you own and it's current value is vital in case of loss, damage, theft or disaster. Home Management Wolf will keep a detailed home inventory record of everything you own and calculate each items current value using universally accepted depreciation prediction algorithms. You can categorize each item into multiple categories (jewelry, electronics, furniture, etc) or organize items by room (kitchen, bedroom, bathroom etc). Save digital photos and scan receipts for each item including information such as Date of purchase, Cost, place of purchase, warranty information and much more. Add an unlimited number of images, videos and file attachments to each item in your home inventory database. If an item is completely destroyed, damaged or lost, images and receipts serve as proof that you purchased and owned the items and result in easier insurance & warranty claims and quicker payouts. Home Management Wolf will automatically calculate the current value of items based on standard depreciation so you know from day to day what a particular item is worth in today's market. This can also be valuable and helpful information if you want to sell an item. Creating and maintaining a Home Inventory protects you in many ways. Simply save the database to a removable media device for safe keeping in a fire protected safe or other location. The fact is that most home owners and renters are not because insurance policies often require proof of ownership and value to be able to recover for losses in a fire or natural disaster. In the US national statistics show you have approx a 1 in 10 chance of having a house fire. Your risks increase depending on where you live for natural disasters like tornados, hurricanes, wild fires, earthquakes, floods, etc. You will need to prove your losses to your insurance company to be able to recover. 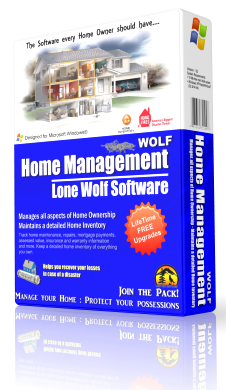 Home Management Wolf will let you create a detailed list of everything you own and become an invaluable tool to help you. Most people don't give a lot of thought to fire safety in the home. But the frequency of fires in dwellings indicates that we all should be thinking about it. According to the National Fire Protection Association (NFPA), in 2007, U.S. fire departments responded to 399,000 home structure fires. These fires caused 13,600 civilian injuries, 2,865 civilian deaths, and $7.4 billion in direct damage. 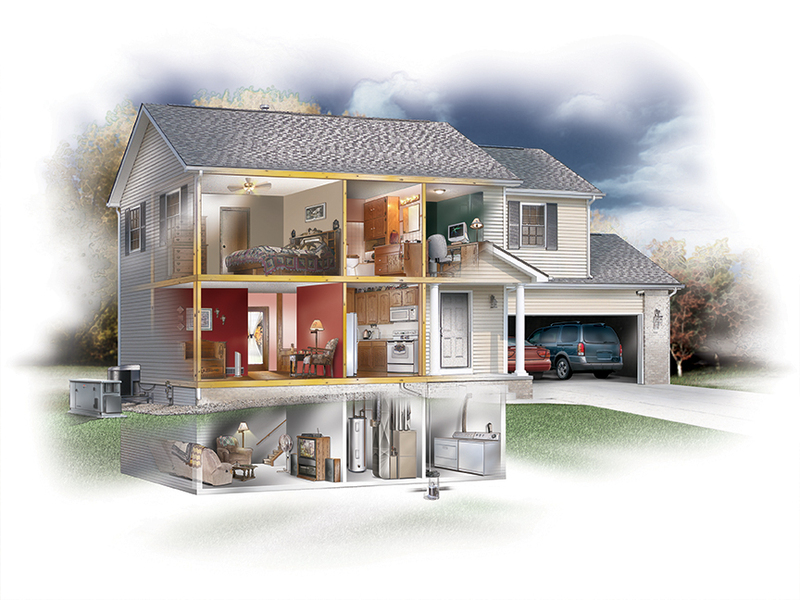 The NFPA compiles statistics for all causes of fire at home and in industry. The leading causes of fires in the home are: cooking, electrical, smoking materials, candles, and heating equipment. A recent survey conducted by the Society of Fire Protection Engineers found that Americans misjudge fire risks. The survey revealed that “70% of Americans feel safer from fire at home than in a commercial high-rise building.” It is truly ironic that where people feel safest, in their homes, is where the majority of fire deaths occur. Consider this; US fire departments responded to an estimated 362,500 home structure fires in 2009. "Just wanted to send a BIG THANK YOU for a great product. I recently suffered a home break-in in which several valuable items were stolen. I had everything recorded in your home inventory software and was able to use it to quickly be reimbursed by my home insurance policy. The agent said she wished everyone would make her job so easy!" "This program is tops. It actually helps me get more work done by planning stuff, keeping track of where all the tools and gear is, helps with keeping all my tractor and other equipment purchase docs together and plan maintenance on my 5 acres of heaven!! Mate thanks for some awesome programs !" "I love the home maintenance planner and the home inventory log. Great Design and extremely useful software." "A superb organization tool for any home owner. One of the best software products I have ever purchased. " Sandy D.
"I've tried several different home inventory software products and this was the best most comprehensive by far. I feel safer knowing I will be covered if I have a fire." All upgrades are FREE and easily downloaded from the Lone Wolf Software server. Includes an Auto Backup option that keeps your database safe. Save it to a removable media device like a USB stick or CDROM that can be placed in a safe place in case a disaster occurs. This information can often be destroyed when a catastrophic event happens but this allows you peace of mind in knowing all your important information is secure.